Fatty tumor with bone-like degeneration — removal. Description : [1 l.] pl., 437-438 p.,  pl. ; ill.: 1 photo. ; 21 cm. Photograph : unverified, clinical view of the subject. Subject : Lipomatous Tumors — Osseous metaplasia. 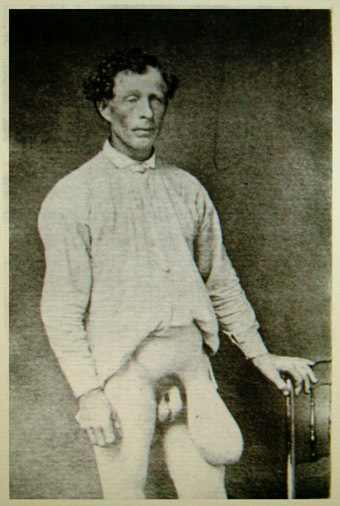 Author caption: "Joseph M. Drake, M.D., Professor of Clinical Medicine University of McGill College." Legacy: "Joseph Morley Drake Chair of Physiology" at McGill. Photo caption: "Dr. Drake's Case of Fatty Tumor." Dr. Drake reports finding osseous metaplasia, that the structure of the tumor had "the external appearance of bone, showing that the centre of the tumor had undergone osseous degeneration, an event of exceedingly rare occurrence."